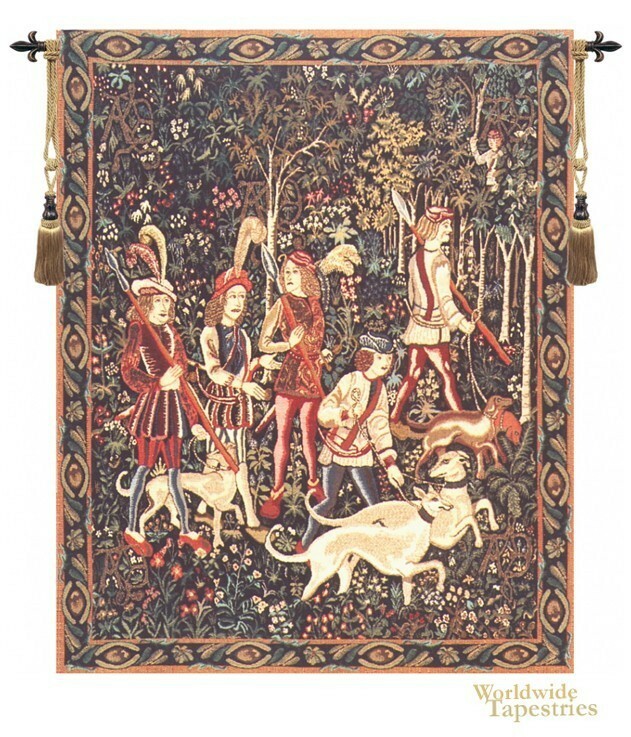 This variation of the "Unicorn Hunt" tapestry shows a scene of the hunters pursuing the capture of the mythical and magical unicorn. The huntsmen of noble origin are shown in their royal garb, and their hounds in pursuit, among the busy backdrop of the mille fleur forest background. . It is a part of the larger work called "Unicorn Captive and Unicorn Hunt". This unicorn art tapestry "Unicorn Hunt " is backed with lining and tunnel for easy hanging. Note: tapestry rod and tassels, where pictured, are purchased separately.